Have you been lucky enough to encounter the quill pig? 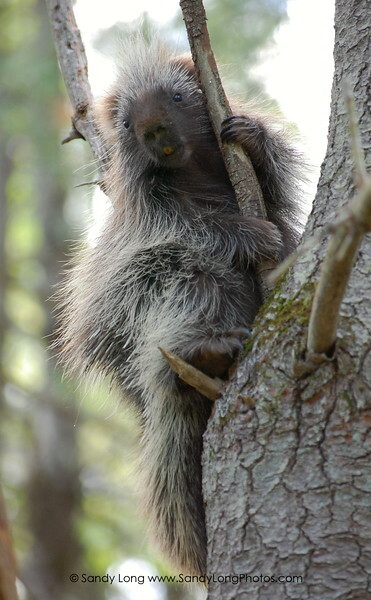 Were you afraid you would be harmed when this woodland creature shot its quills at you? Fear no more, as this slow-moving, non-threatening and frankly, adorable creature can not, in fact, throw its quills at all. The greatest defense this mammal exhibits is its ability to thrash its tail and make its quills stand at alert. If you (or your dog) are within "thrashing" range, or if one of you bites the quill pig, you may indeed be "quilled." Keeping a respectful distance of several feet away, you will be rewarded with a memorable encounter that is harmless and pleasant. Enjoy the wandering waddle of this woodland wonder.